KINARM Exoskeleton Labs™ are sophisticated platforms to monitor and manipulate the upper limb, providing a broad range of hand and joint-based kinesiological information. 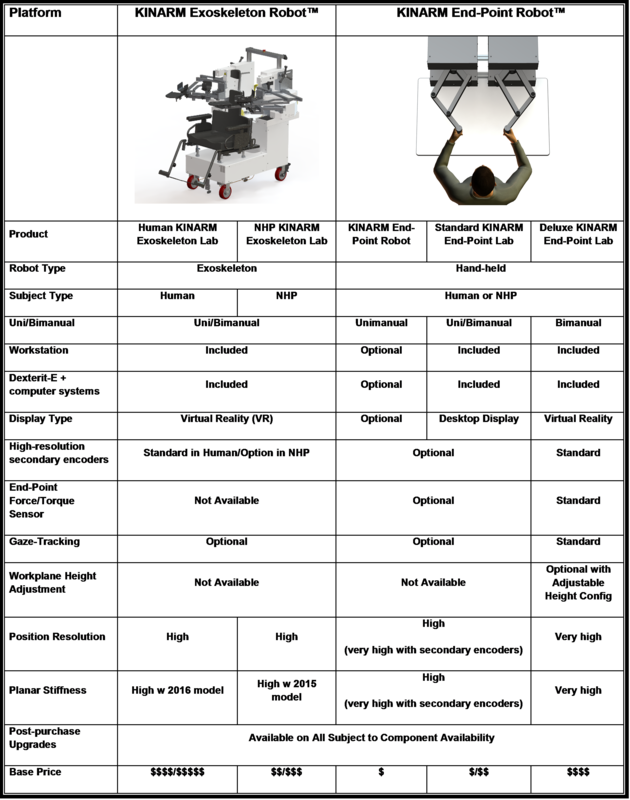 Additional options to the KINARM Exoskeleton Lab include: a unilateral optional; secondary encoders for higher resolution position feedback to increase the effective stiffness of the system; and integrated gaze-tracking for eye-hand coordination studies. KINARM End-Point Labs™ are sophisticated platforms to monitor and manipulate the arm by hand grasp alone in 2-dimensional space. 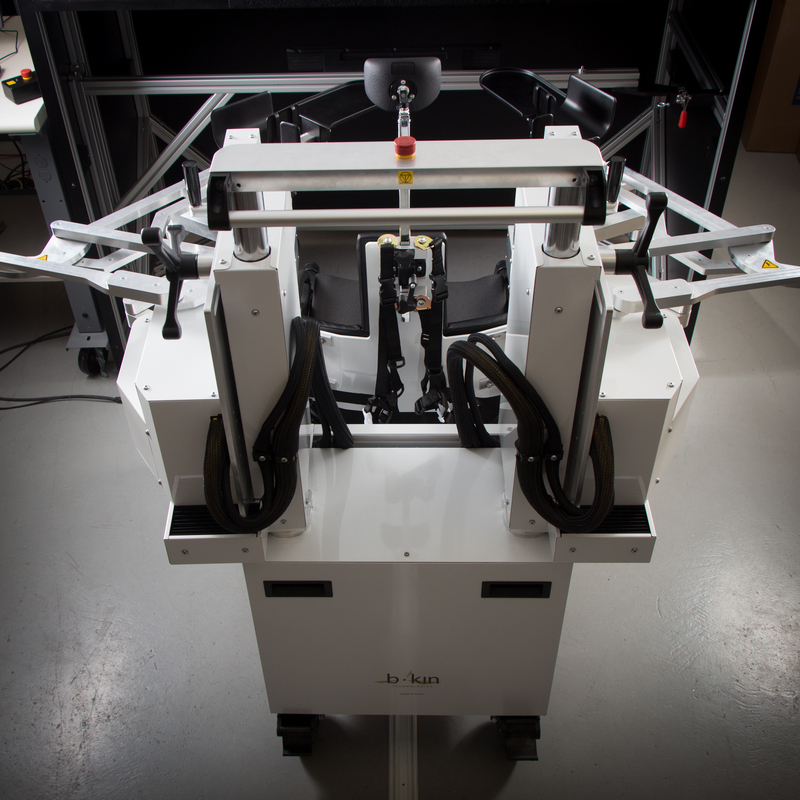 The lab has one or two graspable robot(s) that can create highly complex mechanical environments. The labs are modular, ranging from a single stand-alone robot to a full lab with two robots, integrated virtual reality and data acquisition systems. Additional options to the KINARM End-Point Lab include: end-point force-torque sensors, secondary encoders for higher resolution position feedback, integrated gaze-tracking for eye-hand coordination studies and adjustable height configuration with integrated force plates for postural studies. Fundamental to BKIN’s approach is our 2-dimensional paradigm in which the workspace is restricted to a single plane. This 2-dimensional paradigm represents the optimal balance between behavioural complexity and measurement simplicity. Our virtual/augmented reality systems allow visual information to be presented in the plane of the workspace. Aligning the visual and mechanical environments in this manner takes advantage of the natural coupling that exists between the visual and proprioceptive systems. BKIN Technologies can help you choose the right product to fit your needs. Our multidisciplinary team has deep neuroscience experience and works closely with basic and clinical researchers to understand their research goals and integrate our technologies into their unique research program. Exoskeleton robot provides feedback from, and control of, the shoulder and elbow joints. End-Point robot does not. 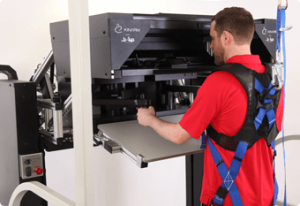 Exoskeleton robot provides gravity support for subjects which is essential for enabling sensorimotor assessments in subjects with upper arm weakness such as subjects with stroke, spinal cord injury, Parkinson’s disease, or multiple sclerosis. End-Point robot is stiffer than the Exoskeleton, allowing much higher feedback gains in the control loop. For example, force channels are possible with the KINARM End-Point robot, whereas they are ‘sloppy’ with the KINARM Exoskeleton. End-Point Lab was specifically designed to be modular to enable expansion of the lab as funds become available. One can start with just a single unilateral robot and build all the way up to the Adjustable Height Configuration KINARM End-Point Lab through a phased approach. Where “assessment time” is short, and gravity support of the upper limb is not required, time can be saved (~10 minutes) by using the End-Point Lab. YES, please contact me by email to discuss more about KINARM products.